Sinister Sides, a record which not only features Geof O'Keefe of Bedemon and Pentagram fame but also which ominously ebbs and flows, inspiring the listener to dig deep into the surreal and powerful soundworlds that make stoner rock great. There is something strangely transcendent about Sinister Sides that comes largely from the fact that it is so clearly a labor of love. It's records like this one, which toil over even the finest points, everything from the guitar tone to the track order have been optimized in order to best showcase what the band is capable of. The use of O'Keefe is extremely tastefully done, he rarely dominates but rather is a potent addition, and makes me wonder what Blackwulf might be able to accomplish with a twin guitar attack. Toss in a few other ragers, a stunning cover of Sunshine Of Your Love and counterbalance it with a potent ballad and you start to get a sense for how great these guys are. Sinister Sides is a record that came right up and blew me out of the water, but it's also a record that has a lot of potent subtle touches. As much as it's easy to love the fat riffs and brash choruses on a song like Tempest there also is a very real majesty to the record, and a depth that, again, comes from the simple fact that this is a monumental labor of love. 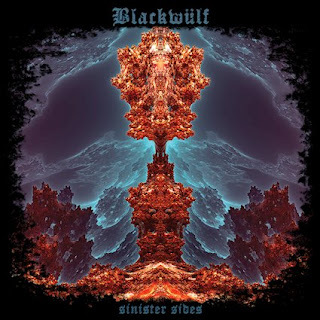 Blackwulf have taken a huge step forward with their third full length and the three year wait was more than worth it. Now I'm just stoked to see them pull it off live!